Is the age of the Earth old or young? Nathan Jones: Mike, one question we get a lot, and I even read it posted recently on our YouTube channel, is that people are always bashing Christians for our belief contrary to what Science claims to have proven in that the earth is millions and millions of years old. People want to know why we don't just get off this Young Earth belief and accept Science's conclusion for how everything came about through Evolution. How do you respond to people like that? Mike Riddle: That is a very big question. People do believe, not only non-believers unfortunately as there are many Christians out there as well, that scientists have proven the earth is billions of years old. That comes from a misinterpretation or misunderstanding of the limits of science. Scientists cannot prove the age of the earth. We divide science into two main areas. One is called Observational Science or Operational Science. That's how we build our jet engines and how we make our medical technology and how we develop computers. Those are things that we can observe. We can touch and feel them. Then there is another area of science called Origins Science, or Historical Science, which covers those events that happened in the past. People obviously were not there to observe them happening. Therefore, we have to piece the clues together. In other words, dating the origins of anything long past is based on assumptions or our interpretation of the evidence. That there are different types of sciences is what people do not understand. The scientist cannot prove the age of the earth, because according to Science he would have to have been there to observe it being made. Incidentally, what many scientists are not looking at is the overwhelming amount of scientific evidence that shows the earth is very young. The real issue for believers is that they are not starting with the Bible. When I read the Bible beginning with Genesis, it starts off telling us that God created everything in six days. God uses the word "day" there. What God did to make sure we understand they were literal days is that He put a number with each day: first day, second day, third day, fourth day. I like to ask people: "How many times did God use a number with the word 'day' in the Old Testament?" It's 410 times, and not one of those occasions does 'day' mean a long period of time! God even made it easier for us because He defined His days as each having an evening and a morning. There was "evening and morning, the first day." There was "evening and morning, the second day." Everywhere in the Old Testament account we see the phrase "evening and morning." Each day then could only mean one 24-hour day. But, God didn't stop there. What a wonderful God we have! When He wrote down the Ten Commandments, in commandment number four He wrote this down, "For in six days the Lord made the heaven, the earth, the sea and all that it is in them therefore..." I like that word "therefore," for if we don't accept God's days of creation as being literal days, then commandment number four doesn't mean what it really says and it becomes open to our interpretation. If commandment number four is open to our interpretation, then how can we trust the other nine? Nathan Jones: Commandment number four being about keeping the Sabbath day. Mike Riddle: Right. By giving up our foundation in Genesis, we now have given up a literal interpretation of the Ten Commandments. This becomes a serious issue. Dr. Reagan: There was one observer of the Creation, and He has told us how He did it. It is God Himself. Dr. Reagan: But, there are no scientists who were there to observe the earth being formed, so they really haven't proved their origins theories? Mike Riddle: No, they can't prove the age of the earth because scientifically they would have had to have been there to observe the earth being formed. What they do instead is they look for evidence that would tell the story. We all look at the same evidence, but then we interpret what we see. People interpret based on our own worldview. That becomes our starting point. As for me, I start with God's Word as my authority. In the third segment of this Creation training series with Mike Riddle, he'll explain why believing in the Genesis account of the Creation should matter to Christians. Not to challenge the whole idea of days being literal because in creation I agree-they are. 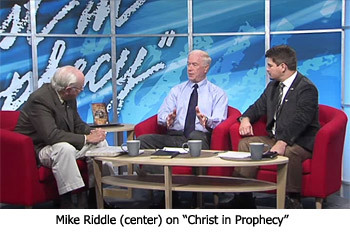 I am only wondering the first point of logic from the Bible in which Mike Riddle talks about defining days with "evening and morning" and how he states: "I like to ask people: "How many times did God use a number with the word 'day' in the Old Testament?" It's 410 times, and not one of those occasions does 'day' mean a long period of time!" Is that true? I think of Daniel, chapter 8 when it says "The vision of the evenings and the mornings that has been told is true, but seal up the vision, for it refers to many days from now." This after describing a day and night period of 2,300 which we know as the great tribulation. Then I think of Chapter 9 when it describes the 70 weeks of Daniel and describes 62 weeks. We all know creation to now has not been 70 weeks. Then I think of how we are in the church age and the days are not literal because it is not a days fulfillment but a number of believers before the rapture will happen fulfillment (which is what a lot of prophecy scholars believe). And there was evening, and there was morning—the second day. And there was evening, and there was morning—the third day. And there was evening, and there was morning—the fourth day. And there was evening, and there was morning—the fifth day. And there was evening, and there was morning—the sixth day. Based on the context of day in Genesis 1 it sounds like a 24 hour day to me. I agree with E.W. Bullinger's account that the earth had another age before this one and there will be a third age after the one we are in now .. This Is Appendix 146 From The Companion Bible. To arrive at the true meaning of this expression, we must note that there are two words translated "foundation" in the New Testament: (1) themelios, and (2) katabole. The Noun, themelios, occurs in Luke 6:48-49, 14:29, Acts 16:26, Romans 15:20, 1Corinthians 3:l0-12, Ephesians 2:20, 1Timothy 6:19, 2Timothy 2:19, Hebrews 6:1, 11:10, Revelation 21:14,19. It is never used of the world (kosmos) or the earth (ge). The corresponding Verb (themelioo) occurs in Matthew 7:25, Luke 6:48, Ephesians 3:17, Colossians 1:23, Hebrews 1:10 and 1Peter 5:10. The verb is only once used of the earth (ge). Hebrews 1:10. A comparison of all these passages will show that these are proper and regular terms for the English words "to found", and "foundation". The Noun, katabole, occurs in Matthew 13:35, 25:34, Luke 11:50, John 17:24, Ephesians 1:4, Hebrews 4:3, 9:26 , 11:11, 1Peter 1:20, Revelation 13:8, 17:8 and the corresponding Verb (kataballo) occurs in 2Corinthians 4:9, Hebrews 6:1 and Revelation 12:10. A comparison of all these passages (especially 2Corinthians 4:9 and Revelation 12:10) will show that kataballo and katabole are not the proper terms for founding and foundation, but the correct meaning is casting down, or overthrow. Consistency, therefore, calls for the same translation in Hebrews 6:1, where, instead of "not laying again", the rendering should be "not casting down". That is to say, the foundation already laid, of repentance, etc., was not to be cast down or overthrown, but was to be left and progress made unto the perfection. Accordingly, the Noun katabole, derived from, and cognate with the Verb, ought to be translated "disruption", or "ruin". The remarkable thing is that in all occurrences (except Hebrews 11:11) the word is connected with "the world" (Greek kosmos. Appendix 129.1), and therefore the expression should be rendered "the disruption (or ruin) of the world", clearly referring to the condition indicated in Genesis 1:2, and described in 2Peter 3:5-6. For the earth was not created tohu (Isaiah 45:18) but became so, as stated in the Hebrew of Genesis 1:2 and confirmed by 2Peter 3:6, where "the world that then was by the word of God" (Genesis 1:1), perished and "the heavens and the earth which are now, by the same word" were created (Genesis 2:4), and are "kept in store, reserved unto fire against the day of judgment" (2Peter 3:7) which shall usher in the "new heavens and the new earth" of 2Peter 3:13. "The disruption of the world" is an event forming a great dividing line in the dispensations of the ages. In Genesis 1:1 we have the founding of the world (Hebrews 1:10 = themelioo), but in Genesis 1:2 we have its overthrow. This is confirmed by a further remarkable fact, that the phrase, which occurs ten times, is associated with the Preposition apo = from (Appendix 104. iv) seven times, and with pro = before (Appendix 104. xiv) three times. The former refers to the kingdom, and is connected with the "counsels" of God; the latter refers to the Mystery (or Secret; See Appendix 193) and is connected with the "purpose" of God (see John 17:24, Ephesians 1:4, 1Peter 1:20). Ample New Testament testimony is thus given to the profoundly significant fact recorded in Genesis 1:2, that "the earth became tohu and bohu (i.e. waste end desolate); and darkness was on the face of the deep", before the creation of "the heavens and the earth which are now" (2Peter 3:7). notes on Genesis 1:1 and 1:2. This Is From The Companion Bible. 1. IN the beginning °God °created °the heaven and the earth. 2. °And °the earth °was °without form, and void; and darkness °was upon the °face of the deep. And °the Spirit of God moved upon the °face of the waters. 1. "THE WORLD THAT THEN WAS" (2Peter 3:5,6). See Structure, page 1. Creation in eternity past, to which all Fossils and "Remains" belongs. God. Hebrew Elohim, plural. First occurence connects it with creation, and denotes, by usage, the Creator in relation to His creatures. See Appendix 4. The Hebrew accent Athnach places the emphasis, and gives pause, on "God" as being Himself the great worker, separating the Worker from His work. the heaven and the earth. With Hebrew Particle 'eth before each, emphasising the Article "the", and thus distinguishing both from 2:1. "Heavens" in Hebrew always in plural. See note on Deuteronomy 4:26. 2. And. Note the Figure of Speech Polysyndeton (See appendix 6), by which, in the 34 verses of this Introduction, each one of 102 separate acts are emphasised; and the important word "God" in verse 1 is carried like a lamp through the whole of this Introduction (1:1 - 2:3). the earth. Figure of Speech Anadiplosis. See appendix 6.
was = become. See Genesis 2:7; 4:3; 9:15; 19:26. Exodus 32:1. Deuteronomy 27:9. 2Samuel 7:24, etc. Also rendered came to pass, Genesis 4:14; 22:1; 23:1; 27:1. Joshua 4:1; 5:1. 1Kings 13:32. Isaiah 14:24 etc. Also rendered be (in the sense of become), verse 3 etc., and where the verb "to be" is not in italic type. Hence, Exodus 3:1, kept=became keeper, quit = become men, etc. See Appendix 7.
without form = waste. Hebrew tohu va bohu. Figure of Speech Paronomasia See appendix 6. Not created tohu (Isaiah 45:18 See Above), but became tohu (Genesis 1:2. 2Peter 3:5,6). "An enemy hath done this" (Matthew 13:25,28,39. compare 1Corithians 14:33). See Appendix 8.
was. This is the italic type, because no verb "to be" in Hebrew (see Appendix 7). In like manner man became a ruin (Genesis 3. Psalms 14:1-3; 51:5; 53:1-3. Ecclesiastes 7:20. Romans 7:18). face. Figure of Speech Pleonasm. See appendix 6.
the Spirit of God moved (see Appendix 9) = The beginning of "the heavens and the earth which are now" (2Peter 3:7). It is even so in the New Creation. The Spirit moves (John 3:3-8. Romans 8:5,9,14. Galatians 4:29. 2Corinthians 5:17,18). .. Go to the below for Appendixes to The Companion Bible ..
Billy, I think you misunderstand my statement and my question. I do not dispute that Genesis gives a Biblical account of literal days in the creation. I in fact state them as literal myself. I am questioning the apologetic of going to someone and claiming that there are 490 cases of the word "day" in the new testament and all of them being literal. I admit not know the original Hebrew and ask if that is really the case. I however also offer verses in Daniel in which time is not literal since we all know that this has not taken just 70 weeks. I may be able to count 70 more weeks from today before the rapture happens. "Days" is throughout Daniel in these verses I referenced, but I admit I am not a Linguist nor am I knowledgeable regarding the translation of Biblical language. Everything you say is true and we agree. I take the creation account in the Bible to be literal too. The point again was questioning the apologetic because we should be able to talk with people about creation since there are so very many who do not believe Jesus is Lord who will immediately use creation and science to challenge our faith. The very point of this study. Rick, there have been stages in the earth, five to be exact, but not a pre-Creation Satanic age. Thanks for the comment. Just to clarify, I was just commenting in general, not specifically towards you. But you are right, the weeks aren't our 7 day week so you do have to figure these things out (or in my case be lucky enough to read what others opine then form my own judgements on fact). For example, no offense to Rick Kelly's posts, but my mind just doesn't absorb that type of information. I'm more of a keep it simple type of thinker because my faith in the Bible is very, very childlike. Satan is called “the prince of this world” by Christ (See John 12:31) and “the god of this world” by the Apostle Paul (2 Corinthians 4:4). Where did Satan’s claim come from? In Luke 4:5-6, Satan told Christ that all the kingdoms of the world had been given him (“for that is delivered unto me”). Christ did not deny his claim, but rather answered …”for it is written, Thou shalt worship the Lord thy God, and him only shalt thou serve.” (Luke 4:7-8). When did Satan become the ruler of the earth and have dominion over it? When Satan showed up in the Garden of Eden, before the fall of man, he is already the serpent, and in opposition to the Lord God. The question is: If Satan had dominion over the world along with angels, when did this take place? In Isaiah 14:12-15, is where Satan’s original rebellion against God is recorded, Satan desired to exalt his throne above the stars of God (Isaiah 14:13). In order to exalt his throne, he had to have a throne. A throne indicates a place of rule and dominion as well as a kingdom to rule over. This kingdom of Lucifer was ruled by him before his fall which was below the stars of God and below the heights of the clouds. He ruled over the entire earth. Lucifer’s throne was on the earth before he rebelled against God. This is how he claimed to have dominion over the earth. Yet, we do not know how many years ago this took place. After Genesis 1:1and before 1:2, was Lucifer’s domain until he fell. During the age of Lucifer’s dominion over the earth, he and his angels covered the entire earth. No doubt there was great cities where angels resided. Forests, animals and wonderful flowers no doubt existed among many other beautiful things. Most likely Lucifer and the angels lived in a multi-dimensional world where travel to God’s heavenly throne was possible including other interstellar travel. There is no way of calculating how many years Lucifer had dominion over the earth before his fall, but certainly it could have been millions of years if not more. When Lucifer fell and became Satan (the Devil), God judged him and the angels who sided with him, and the earth became without form and void, and darkness was upon the face of the deep, And the Spirit of God moved upon the face of the waters (Genesis 1:2). This was the first flood to envelope the earth. The destruction that took place must have been horrendous and so severe, that today there is no known trace of Satan’s civilization, yet we know it existed. The earth had to be untold years old in order to accommodate Lucifer’s civilization and the angels he ruled over. At this point, it is unbelievable that Young Earth Creationists (YEC) can maintain that the earth is only 6000-10,000 years old. What time frame can they place Lucifer when he had dominion over the earth? We know he had fallen well before he entered the Garden of Eden as he took on the appearance of a serpent when he approached Eve and tempted her. There is much more to my research, but am limited by the number of characters. Is there a conflict between Nathan and Dr. Reagan on the age of the earth??? Satan was a murderer from the beginning (John 8:44) and he sinneth from the beginning (I John 3:8). This most likely would have to have occurred to the beginning of the six-day creation. • First, this interpretation would make God the author of sin. • Second, the Bible clearly states that the devil was perfect from his creation, and that iniquity was not found in him until a later date (Refer to Ezekiel 28:15). “For, as the fossil remains clearly show, not only were disease and death----inseparable companions of sin---then prevalent among the living creatures of the earth, but even ferocity and slaughter. And the fact proves that these remains have nothing to do with our world; since the Bible declares that all things made by God during the Six Days were very good, and that no evil was in them till Adam sinned. Bob, Dr. Reagan and I are totally in agreement about the Earth being young. Your entire supposition is that Satan ruled over the earth before Adam and Eve. And yet, from the very beginning in Genesis 1:26-30, God created mankind to have dominion over the earth. The earth was not Satan's, but man's. Mankind when they sinned gave their authority over to Satan, so that he has rulership over the earth (Mat. 4:8-9). One day soon Jesus will come back to claim what He bought on the cross. The rest of what you said is all science fiction, for none of it is found in the Bible. Nathan: Did Dr. Reagan change his mind about the age of the earth? I quoted much of his articles unless we are talking about a different Dr. Reagan. Please clue me in...thanks. As far as a young earth goes, I guess we will have to agree not to agree. The late Dr. Henry Morris and others who adopted his view, have led many Christians down the wrong path, in my opinion. Bob, you were quote Dr. David F. Reagan. Our senior evangelist is Dr. David R. Reagan. We'll clear that up in tomorrow's post. Not taking the Bible literally is what has done the most damage to the Christian witness, not a literal Young Earth reading. Mike Riddle will get into that in the eleventh and last segment of this series. If Genesis 1:2 (the earth was without form and void... and the Spirit of God moved upon the face of the waters) was part of the original creation, as you suggest, then why did God create it without form and void and covered with water??? God creates everything perfect..do you agree that He does create everything perfect? Water covering the earth always speaks of judgment...yes or no? Bob, why do you suppose that to start the earth being without form and void was not perfect? Does the painter say the blank canvas is not perfect, or under judgment? Waters covering the earth became a judgment at Noah's Flood, with no flood being recorded beforehand or afterwards (per the Noahic Covenant). 2 Peter 2 calls Noah's time the "ancient world," not the newer or less ancient world. Again, your theories are all science fiction with no biblical support whatsoever. Fantasy! Bob, you're welcome to teach sci-fi on your own website, but here we teach the Bible. You're welcome to post a link, but after that I'm deleting your long pages of "proofs" from here on out. You said "He ruled over the entire earth. lucifer’s throne was on the earth before he rebelled against God. This is how he claimed to have dominion over the earth." But the Bible says over and over that creation was "good". If, as you say, "satan was a murderer from the beginning (John 8:44) and he sinneth from the beginning (I John 3:8). This most likely would have to have occurred to the beginning of the six-day creation." then how could an Earth ruled by satan ever be called "good" by God? That is enough proof for me that your ideas are not correct. The galaxies, the solar system, the sun and planets including earth travels around the sun at different orbit, and the moon circulating the earth, all came about in one day, the fourth day, amazing. Some argue that it is impossible since the universe is expending and that the speed of light proves that by the time the light reaches earth millions of years have pass. They concluded that the universe is billions of years old. The error in that theory is that God created the universe and the law of physic all in one day, therefore setting in motion from that advent the expansion of the universe. We need to realize Bob that God in the beginning of creation did it supernaturally, but did it in stages. So the phrase "without form and void" means that it had no dry land, grass, herb yielding seed, and the fruit tree yielding fruit. God did it this way so that the earth would be occupied with man and animals so he had to get it ready for them. God could of spoke everything into existence at one time, but he did it in six days and rested on the seventh as an example to man. Also Rick Kelly your theology about creation is wrong. You can't have death and destruction before Adams fall. And there is not one verse in scripture that supports a preadamite world. That would also go against what the Bible truly teaches. I have a Jimmy Swaggart Bible that teaches the same thing, but it is wrong. You need to get rid of those bad translation Bibles and get yourself a New Defender's study Bible by Henry Morris, and learn the truth about creation. In my first post the phrase "would be occupied with man" should say "could be occupied with man"